French counter-tenor Philippe Jaroussky was at the Wigmore Hall last night (1 December 2016) with a new French ensemble Le Concert de la Loge, director Julien Chauvin, for a programme of cantatas by Telemann and Bach. We heard Telemann's cantatas Die stille Nacht TWV1:364 and Jesus liegt in letzten Zügen TWV1:983, and Bach's Orchestral suite No. 2 in B minor BWV1067 and cantata Ich habe genug BWV82. Le Concert de la Loge is a new ensemble, founded in 2015 by Julien Chavin and at the Wigmore Hall they fielded a chamber ensemble with single strings (including a double bass), plus flute and oboes as necessary. Telemann wrote a stupendous number of cantatas, with a number of annual cycles and some cycles themed such as in the French style. The cantatas were written for the same purpose as Bach's were, for inclusion in a Lutheran service as a reflection on the sermon. What is fascinating is that given these similar parameters the two composers could come up with such a different feel, with Telemann's writing often feeling more lyrical and mellifluous, whereas Bach mined the intensity of the words. We opened with Telemann's Ouverture burlesque in B flat TWV55:B8 which started quite stately, with a strong sound from the ensemble, alternating with a more perky middle section which hinted at the burlesque element. The overture led straight into Telemann's cantata Die stille Nacht, a reflection on Christ in the Garden of Gethsemane. The opening accompanied recitative was rather striking with a lyric vocal line of detaché strings, creating a very powerful image as the singer describes Christ's emotions in the scene. 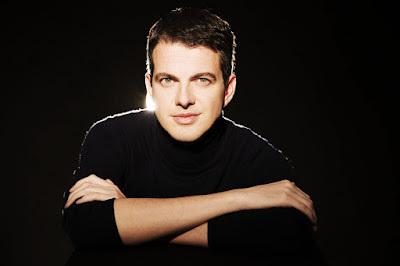 The first aria had a rather lilting accompaniment with rather squarer vocal line, with Philippe Jaroussky giving a very passionate performance. Secco recitative led into the second aria ('My Father! If it so please you let the cup now pass from me'), an attractively melodic piece with flute obliggato which developed in intensity in the middle section. Further recitative led to the strikingly rhythmic final aria. Jaroussky was in good voice singing with strong, bright forward tone and with a lovely ease at the top of his register. His German was creditable rather than excellent, there were a few mushy vowels and he did not make anything like enough of his consonants. You could only follow clearly if you had the printed text in front of you. The overture to Telemann's St Matthew Passion TWV5:53, a grave piece with attractively varied textures was followed by an organ obliggato which led directly to Telemann's cantata Jesus liegt in letzten Zügen which describes Christ on the cross. The opening aria was a sombre piece, sober yet attractively melodic, and rather substantial, which received a very moving performance. Secco recitative, but with striking melisma on the word 'Pitiful', led to the second aria where there was a lovely intertwining of oboe, violin and voice, again creating something rather moving. The final section of recitative led to a vigorous concluding aria full of ornamental passages. Though Jaroussky's passage-work was impressive there were hints that it was not quite pin-point, but overall he and the ensemble brought a moving gravity to the cantata. After the interval we turned attention to Bach, first with his Orchestral suite No. 2. The Ouverture was stately and vigorous, with a fine strong bass and the fast section went with a lovely swing. The Rondeau was graceful with a certain rhythmic vigour, whilst the Sarabande was elegantly melancholy. With just a single instrument per line there was a very timbral quality to the performance, and we could admire the interplay of the different instruments, voices coming and going. The two Bourrees were perky with a strong sense of the lively articulation used by the strings. The Polonaise was very rhythmic, and full of strong contrasts, with a sparer texture in the Double. The graceful Menuett let to the famous Badinerie which was a complete delight. Bach's cantata Ich habe genug went through various versions, being used at least five times in Leipzig. Originally for a bass soloist (representing Simeon), it was here sung in the version for high voice with oboe obliggato. The opening aria, Ich habe genug, combined a fluid, nutty-toned oboe with lovely undulating strings, their phrasing matched by Jaroussky when he entered. His voice seemed remarkably ageless, and his performance had a beautiful fluid ease to it. The second aria, the lullabye Schlummert ein, combined a rich toned string accompaniment with a gently meandering vocal line. Jaroussky's vocal control making it rather mesmerising. The final aria was taken at quite a fast empo and full of vitality. Though there was a sense of the speed being on the upper limits of the possible, Jaroussky's passagework as impressive. The Wigmore Hall was full and the audience response as enthusiastic so we were treated to two encores, first an aria from Telemann's Brockes Passion and then and aria from Bach's cantata Freue dich, erlöste Schar BWV30. Following the concert Jaroussky was signing CDs for his recent release of cantatas by Bach and Telemann on the Erato label.